We also want to thank everyone who has been so kind and sent cards, gifts, food, and well wishes to the house. I hope that I either sent a thank-you note or an e-mail or made a phone call. Please forgive me if I overlooked anyone. You can imagine how crazy things have been around here lately. Except for the fatigue, I feel pretty well. Ryan shows no sign of fatigue-he is going 90 mph. He starts his VP-16 today. Please say a prayer that he won't feel any side effects (especially for the next couple of days). The final report from the biopsy and the MIBG are "Minimal disease" and we really doubt there is any disease there at all. 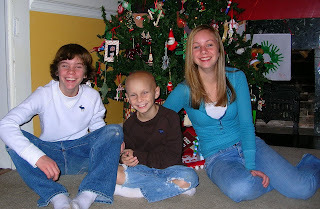 The liver biopsy was negative for any Neuroblastoma! The MIBG showed a faint light-up on Ryan's left collar bone, but it is hard for us all to believe that much larger spots cleared up, but not this small place. So, Ryan doesn't qualify for the ABT-751. We have a couple of options. We know we need to continue some kind of treatment even though there may be no disease present. For right now we are going to go with low dose VP-16, but may change in a couple of months after my surgery and radiation is finished. With VP-16 he will take one pill a day for 3 weeks and be off a week. The other option involved multiple pills every day, and we just feel something simple might be the best way to go for right now. My surgery is scheduled for January 16th. I am thrilled to have it scheduled and look forward to getting it over with. Please pray that it will go smoothly with no complications. And while you're at it, please throw in a prayer that it won't hurt too much. Thanks to everyone who has put ornaments on Ryan's Giving Tree. It is almost at 1000 ornaments. He loves checking on it. All of the money raised goes to Neuroblastoma research. We sat down with Dr. George yesterday to discuss the requirements for starting ABT-751. Ryan will need to under go MIBG and CT scans, Echo, Liver biopsy or maybe partial resection where it has been lighting up the MIBG scan for ever, bone and marrow biopsy, lots more blood work and likely another round of chemo. There sooo are many hoops to jump through to begin a trial and it all has to happen in a very tight time frame. Then there is also the possibility that Neuroblastoma will not show up at all in any test after these last 11 rounds of chemo and Ryan will be declared NED ! That would be the greatest Christmas present we could receive, it's number one on our list. Either way it goes, it's still scary. The kids are so excited about their Grandma and Grandpa flying in next Monday, they can hardly wait. I guess they'll get to hang at Scottish during the days while Ryan tests. It's going to be busy! 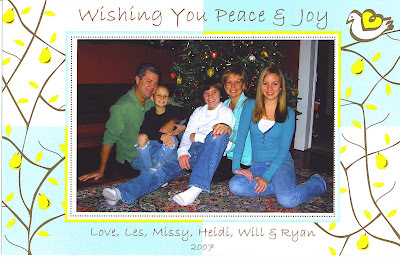 Happy holidays, Les, Missy, Heidi, Will and SuperRyan.